UNDERAGE DRINKING IN YOUR HOME WILL COST YOU TIME AND MONEY! 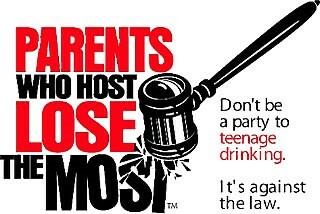 Contact Covina PD to report underage drinking (626) 384-5808. LEGAL DRINKING AGE IS 21! The program takes place at state and local levels, concentrating on celebratory times for youth, such as homecoming, holidays, prom, graduation and other times when underage drinking parties are prevalent. This program encourages parents and the ENTIRE community to send a unified message that teen alcohol consumption is unhealthy, unsafe and unacceptable.